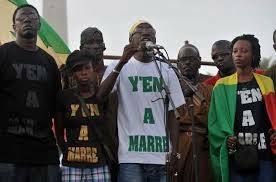 Today, I would like to talk about the “Y’en a Marre” (“Fed Up“), a Senegalese group which influenced change in the presidential election of 2012 in Senegal, by forcing President Abdoulaye Wade (and his son, Karim Wade) out of office. Y’en a Marre decided to stop complaining and to start acting, to make the changes they wanted implemented. It is a group of Senegalese rappers and journalists, created in January 2011, to protest ineffective government and register youth to vote. They are credited with helping to mobilize Senegal’s youth vote and oust incumbent President Abdoulaye Wade, though the group claims no affiliation with Macky Sall, Senegal’s current president, or with any political party. The group was founded by rappers Fou Malade (“Crazy Sick Guy“, real name: Malal Talla), Thiat (“Junior“, real name: Cheikh Oumar Cyrille Touré), Kilifeu (both from celebrated rap crew “Keur Gui of Kaolack“) and journalists Sheikh Fadel Barro, Aliou Sane and Denise Sow. 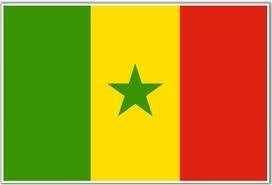 The movement was originally started in reaction to Dakar‘s frequent power cuts, but the group quickly concluded that they were “fed up” with an array of problems in Senegalese society. “One day, there was 20 hours of cuts,” said Fadel Barro, whose dimly lit apartment served as the place where the movement took shape. “I said: ‘Guys, everyone knows you. But you’re not doing anything to change the country.’ ”[from NYT interview – see link below]. Those words energized the musicians. Through recordings, rallies and a network of regional affiliates, called “the spirit of Y’en a Marre“, the group advocates for youth to embrace a new type of thinking and living termed “The New Type of Senegalese” or NTS. In late 2011, the collective released a compilation titled “Y’en A Marre“, from which the single “Faux! 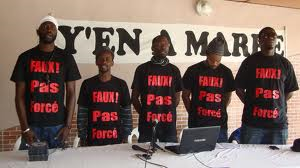 Pas Forcé” (“Don’t force it”) emerged as a rallying cry for youth frustrated with President Wade and his son and presumed successor. They followed with a single, “Doggali” (“Let’s finish”), which advocated for cleansing the country of Wade and son. From April to August 2011, the group and their members campaigned door to door to register young Senegalese to vote at the Presidential election of 2012, and they claimed more than 300,000 voters registered. During 2011, they organized manifestations, called “foires aux problèmes” (“problem fairs”), and sit-ins in Dakar’s Obelisk Square. On 15 February 2012, these manifestations were prohibited by Wade’s government, leading to 3 members of Y’en a Marre’s arrest on the 16th. 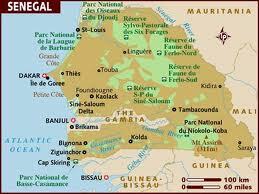 This did not stop the group which continued manifesting until the election of Macky Sall as President. Today, even though Macky Sall has been elected president, Y’en a Marre remains active, hosting meetings, and shows, urging the new government to implement all the promised reforms. So we can all choose to be the change we want to see, stop complaining, and start acting like Y’en a Marre. If there is anything wrong bothering you in your community, it is possible to work at it, to act upon it, and change it the way you want it to be. Our countries all need it, our continent needs it. Read the article the New York Times did on Y’en a Marre, as well as the UNRIC, and the article on NPR. So let’s us be “fed up” like the Y’en a Marre, and let us act and be the change we want to see.